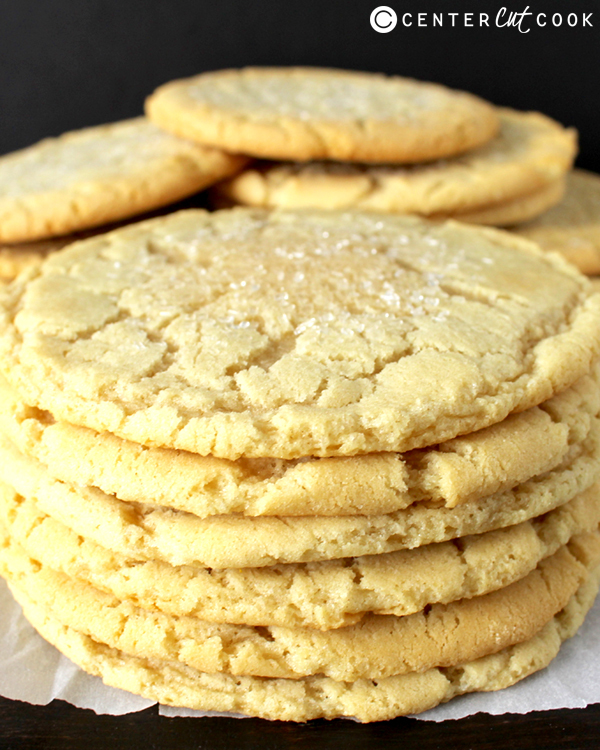 These Jumbo Sugar Cookies are just as delicious as the ones from a bakery and are so easy to make which means they can be enjoyed anytime! 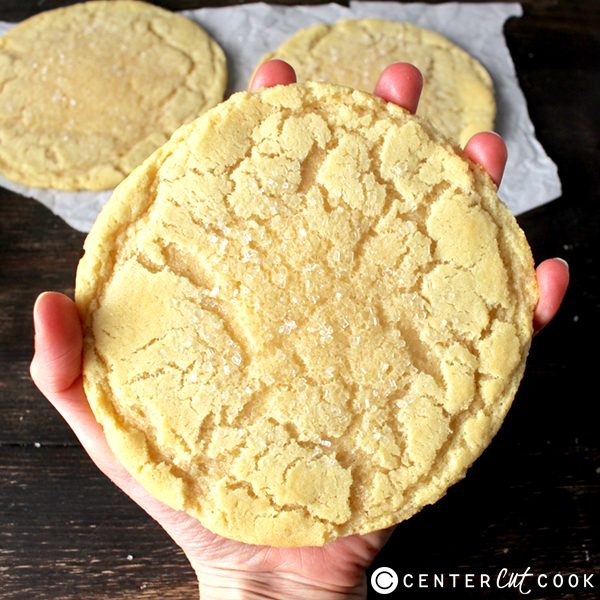 These sugar cookies are so fun (just as fun as my jumbo chocolate chip cookies)!! I wanted to create a huge, soft cookie- just like you would buy from a bakery, and that’s just what these are! They are so easy to make and the dough doesn’t have to chill at all, which means you can be eating a warm cookie in less than 20 minutes!! 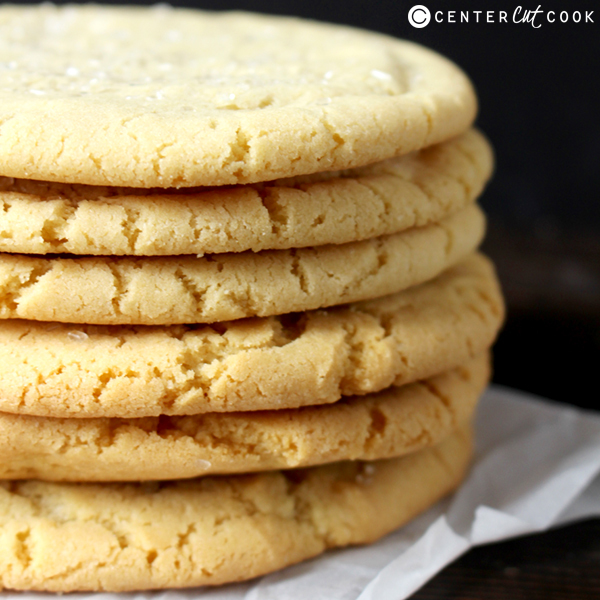 These cookies have a slight crunch on the edges, the center is extremely soft and chewy, they are not overly sweet, and the sugar on top is the perfect addition. The cornstarch that is added helps keep them super soft. The whole batch only makes 6 cookies, so if you need more you may want to double it. Also, because they are so big, you can only fit 3 on a pan at a time. Don’t try to cook them all at once or you’ll end up with one large cookie. These are perfect for gifts and I know it is kind of early to be talking about it, but sprinkle a little red or green sugar on top and these would be great for Christmas! I also love that these cookies don’t have to be rolled out. They are just mixed, scooped, and baked. So easy!! You will love how fast and delicious these are! One bowl and 20 minutes is all it takes until you have some seriously big cookies! Preheat oven to 350° and line 2 cookie sheets with parchment paper. In a large bowl, combine butter and sugar until smooth. Add in the egg and mix well. Add in the flour, baking soda, cornstarch, and salt. Mix until well combined. Scoop into balls using 1/3 cup measure. It should equal 6 even balls of dough. Place 3 dough balls on a cookie sheet, with enough room for them to spread. Slightly press down and sprinkle sugar on top. Bake 14-15 minutes or until lightly browned around the edges. They will be very soft when they come out of the oven, but will set up as they cool.